at a cost of 25€ per person. 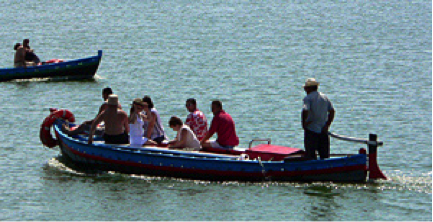 This trip offers an opportunity to explore the region south of Valencia. It will start with a visit to the Monastery at Valdigna. The morning includes a visit to the 13th century Santa Maria de Valdigna monastery. Our next port of call will be the village of El Palmar. Once an island, it is now accessible via a narrow road and even narrower bridge and is situated close to the City of Valencia on the banks of the Albufera lake. Once Europe’s largest fresh water lake, much of the area has been turned over to the cultivation of rice, but the Albufera is still home to carp and eels and an extensive bird reserve with, among others, egrets and blue herons making their home there. Walking into the village itself, it would be easy to think that its 28 restaurants are all it has to offer, but the fishing boats which line the canals on each side of the village bear witness to the main livelihood of its inhabitants. We will stop for lunch in El Palmar, which has a large number of restaurants that specialise in paella and eels for the brave. Lunch is not included in the price. Once back on dry land we will have opportunity of looking inside one of the cosy little thatched cottages called Barracas which are to be seen all over the area. Though very small, inside they seemed surprisingly spacious and comfortable. The price of the trip is 25 euros per person.